Well, I’ve done it. After 14 years I have finally completed Final Fantasy X. 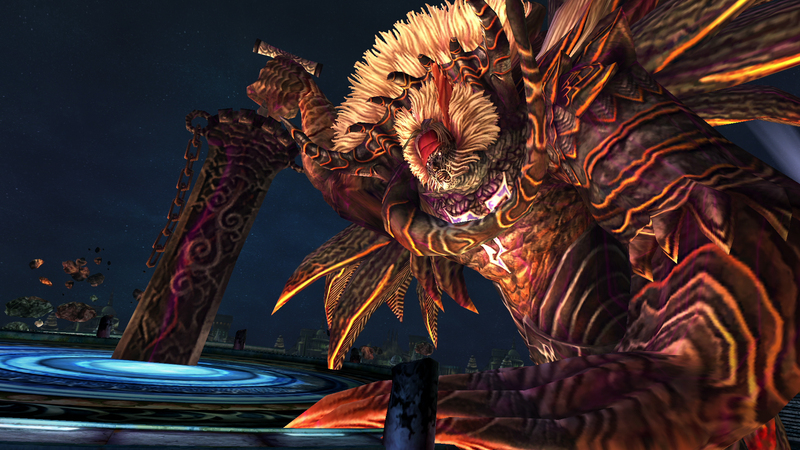 Having stopped at Ixion during my first playthrough I now realize just how much of the story I missed out on, and can more appropriately understand why so many fans shower it with such praise. I can’t say it was my favorite Final Fantasy, but it certainly isn’t as awful as I once believed. I finished the story of Final Fantasy X on Day 264: September 21, 2015. Last week I mentioned the distinct lack of an airship in Final Fantasy X, with which to travel the world and explore new places yet undiscovered. Sure enough, I spoke too soon, as Rikku’s father (Cid) and brother gave us a lift inside of Sin for the finale, and from there I can use it to return to any previously visited town. You can find new places to explore as well, but it’s different from past games in the series. 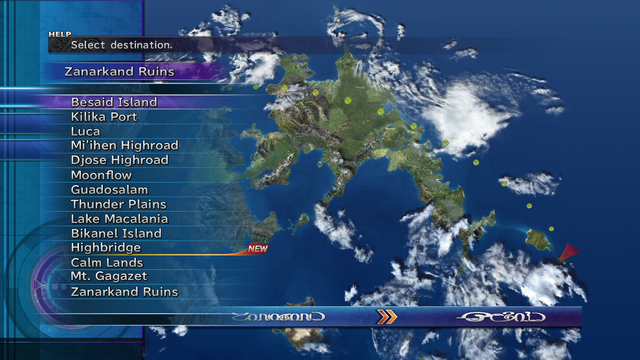 Instead of flying around Spira free-roam as you would in every other Final Fantasy to date, you’re given a list of known locations in the world to select. You make your decision and are immediately dropped at an appropriate Save Sphere. Additionally you can run your cursor over the world map and search for new locations as well, also being dropped at a Save Sphere at their entrance. This is where you’ll find lots of hidden treasures, extra bosses, and the like. It’s less airship-y and more fast travel-y, and just doesn’t feel the same as gliding around freely with some epic accompanying airship music. Still, I have to admit that it’s a neat idea. If Final Fantasy IX is a great game for making the most of past conventions, Final Fantasy X is a great game for taking those conventions, chucking them out the window, and trying lots of new things. Credit where credit is due, and all that. Speaking of those hidden areas and extra treasures and whatnot, I decided to explore just a few of those spots for fun before wrapping the game up. Let me tell you, I could have spent another 20 to 30 hours just wandering through the world again, messing around with side quests and mini-games and extra content. Hell, I never even went back to play a second game of Blitzball following the single mandatory match. Even without delving into the extra bits properly, I could tell that FFX holds an insane amount of content, and that I have only just brushed the surface by playing through the main story. I would really love to come back to it sometime to experience more of what Spira has to offer. Having beaten the game though, I’ve got to say that the ending is honestly really moving, and I still didn’t like Jecht or Tidus when the credits rolled. Even so, their reunion and the parting of ways between Tidus and Yuna were touching moments, made even more emotional by the accompanying soundtrack. Even if I hated the rest of the game (which I didn’t), this soundtrack really knocked it out of the park. Anyway, when I last played Final Fantasy X-2 I was trying to piece together the details I missed by skipping out on X halfway through, so it would be really interesting to play it through again sometime now that I’ve got X’s story completed. One reason in particular is to learn more about Rikku. If you’ve been following my marathon for any length of time, you’ll know that a point that can make or break a Final Fantasy for me is the quality of the characters, and whether or not they get fleshed out. 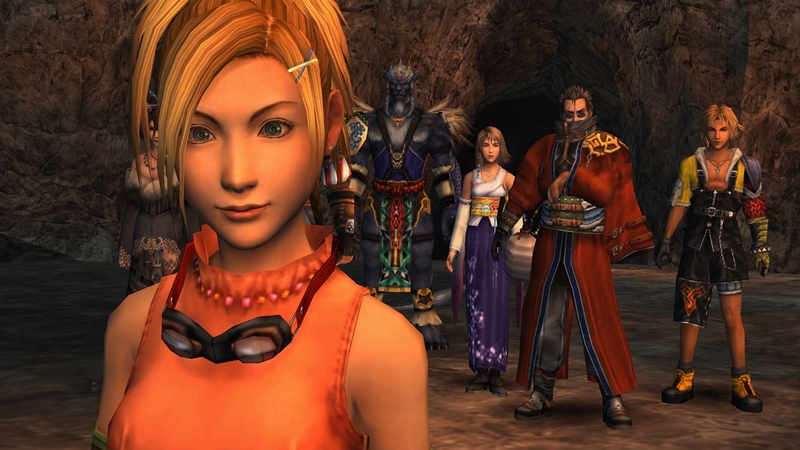 Now Tidus, Yuna, Wakka, Lulu, Kimahri, and Auron all get their moments in the spotlight; you learn their backstories, see them grow, and experience their joy, sadness, successes, and failures. It’s all done very well. Rikku’s place among the party, however, never really made much sense to me. She’s more of a deus ex machina than anything else, to be honest. She conveniently saves Tidus just after he lands in Spira. Then later Wakka’s complaining about the Al Bhed, so suddenly they throw an Al Bhed in your party as a foil and plot device. But when she washes up on shore, she’s only just meeting most of the party for the first time, right? Then suddenly she’s BFFs with Yuna, and Yuna wants Rikku as her guardian. This makes marginally more sense later when Cid unexpectedly calls Yuna his niece, explaining that the two girls are actually cousins, but I don’t recall that relationship ever being mentioned again. Again, Rikku’s presence overall just feels less meaningful than the rest. I’ll wrap up my final thoughts on the game by talking about the final fights of the game, pains that they were. Perhaps I went into them with a bit of cockiness, as once I defeated Seymour Flux on Mt. Gagazet I was given several votes of encouragement on Twitter from followers who claimed he was the worst and most difficult boss in the game (side quests notwithstanding). Still, I had an absolute headache by the time I finally defeated the likes of Yunalesca and Braska’s Final Aeon (Jecht). Each required careful pre-battle planning, appropriate equipment, and cautious strategy throughout in order to survive, but even with all of that and assistance from online guides I still failed several times against them both. The fights were truly unique, and I can appreciate the amount of depth each offered, but I tell you what, it’s been many years since I wanted to throw my controller through the wall so badly. Final Fantasy X was a solid game overall, and one I would gladly revisit in the future; but man, oh man, I’m glad I don’t have to fight either of them again for a loooooong time.